"Bryan and I would like to thank you for everything you did for us with the windows. Never have we had the experience of such great customer service from you, your employees and the product itself. Word of Mouth is a powerful thing and Energy Savers has our word." "We want to thank you and greatly appreciate your help in enabling us to afford new windows in our condo. Your employees were very polite, did a great job and left everything clean. We are very pleased and will enjoy the new windows." Energy Savers Windows, Siding, & Patio Dors has been voted #1 Dealer of the Year for 9 consecutive years. We serve all of Chicagoland, NW Indiana and many other surrounding areas. We specialize in vinyl windows, vinyl siding, and patio doors. Including replacement windows, double hung windows, bay windows, bow windows, garden windows, casement windows, sliding windows, & sliding glass doors. 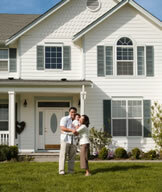 Contact us to receive a Free In-Home Estimate at (708) 301-7426. Copyright © 2012 Energy Savers, Inc. All Rights Reserved.